Anything that has both mass and volume is called matter. For example - me, you, chair, table, computer, mouse, keyboard, dog, cat, cow, ram, pen, pencil, tree, plant, building, stone, brick, mountain, river, etc. Early Indian philosopher categorized matter in five types and called them panch-tatwa (Five-elements) - Vayu (Air), Jal (Water), Agni (Fire), Prithvi (Earth) and Aakash (Sky). According to science matters are divided according to their physical and chemical properties. Which of the following are matter? Anything that occupies space and has mass is called matter. Matter can exist in three physical states - solid, liquid, and gaseous. Chair and almond are forms of matter in the solid state. 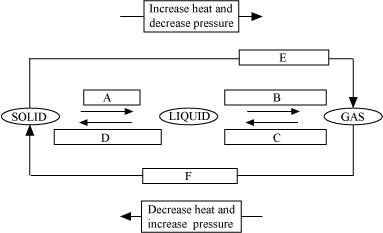 Cold drink is a liquid state of matter. Air is a gaseous state of matter. Note: The sense of smell is not matter. However, the smell or odour of a substance is classified as matter. The smell of any substance (say, perfume) can be classified as matter. This is because, perfume is in liquid state inside the bottle. It comes out in the form of tiny droplets. These droplets of perfume are matter and spread out in the atmosphere to create a sense of smell. This smell can be detected by our olfactory system. What are the characteristics of particles of matter? The mass per unit volume of a substance is called density (density = mass/volume). Arrange the following in order of increasing density - air, exhaust from chimney, honey, water, chalk, cotton, and iron. (a) Tabulate the differences in the characteristics of states of matter. Liquids generally have lower density as compared to solids. But you must have observed that ice floats on water. Find out why. How does water kept in an earthen pot (matka)become cool during summers? Why are we able to sip hot tea or milk faster from a saucer than a cup? What type of clothes should we wear in summers? Convert the following temperatures to Celsius scale. Convert the following temperatures to Kelvin scale. Give reason for the following observations. Arrange the following substances in increasing order of forces of attraction between particles-- water, sugar, oxygen. Why is ice at 273 K more effective in cooling than water at the same temperature? Science : CBSE NCERT Exercise Solutions for Class 9th for Matter in Our Surroundings will be available online in PDF book form soon. The solutions are absolutely Free. Soon you will be able to download the solutions.